Get Fit For The Big Day! Getting in shape for your wedding day is a must for most brides! It can be an overwhelming task to some who do not know where to begin the process. Well we have good news! Last week a new episode of The Wedding Planners debuted at www.thewedplanners.com and it is all about getting fit for the big day! Anthony, Desiree, and Claudia met with several different people in the fitness world in hopes to give brides their best advice for fitness! If you don’t have time to watch the full episode, we have broken it down into segments here on the blog. In this first segment, Desiree Dent meets with Kerry Knee, the owner of Flirty Girl Fitness to learn about getting in shape by taking pole dancing classes. Whether it’s to surprise your man or get in shape, these classes are a great workout! The second part of the show features fitness coach Michael Harris with 1 On 1 Heath Fitness. During this episode, Coach Mike gives his best advice for brides wanting to feel confident on their wedding day. He also demonstrates simple exercises that are a great workout for the big day! During the third segment of this episode, The Wedding Planners interview an upcoming bride who is trying to get fit for her wedding day. What she doesn’t know is that The Wedding Planners and Coach Mike from 1 On 1 Health Fitness have a surprise for her! The last segment of episode 4 features different questions that brides and grooms have about weddings. This week The Wedding Planners answer questions about toasts, average cost of weddings, and cocktail music. Be sure to follow The Wedding Planners as they get ready for their next episode! The Wedding Planner’s Tip: How to Enjoy Your Wedding Day! The Wedding Planners Returns 11/28! A new episode of The Wedding Planners will debut tomorrow, Wednesday, November 28th at 9am CST. You can watch full episodes at www.thewedplanners.com. Still don’t know what The Wedding Planners is a web series starring Anthony Navarro with Liven It Up Events & STAND UP, Desiree Dent with Dejanae Events & WEDology Notebook, and Claudia Antony Zompa with The Bride Scoop and As You Wish Events. Each episode The Wedding Planners talk about trends, tips and tricks, have guests on from different aspects of planning a wedding and sometimes even real brides! Next episode we are talking about unique Save-the-Dates, unique Food Service, and unique ways to dazzle your guests at your wedding! 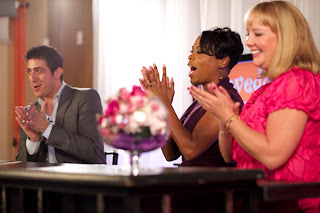 Tune in Wednesday to www.thewedplanners.com to watch the next episode of The Wedding Planners!!! Sneak Peak at Episode 2 of The Wedding Planners! The next episode of The Wedding Planners is coming, Wednesday, November 28th! Here’s a sneak peak of what we have been up too! To watch full episodes, visit www.thewedplanners.com! From The Left, Anthony Navarro with Liven It Up Events, Wendy Pashman with Entertaining Company, Desiree Dent with Dejanae Events, Hareder McDowell, former Bride, and Claudia Antony Zompa with TheBrideScoop! 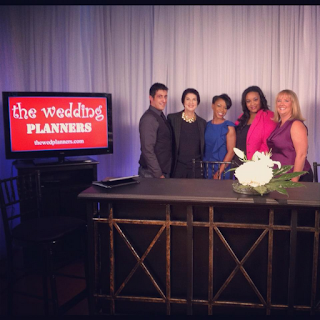 Some of you may know that I am working with a great team of folks, to co-produce and co-host, the new web based talk show series, ‘The Wedding Planners’. Just imagine any day time talk show with a paneled cast, and that is what you have, except we are all wedding planners. I am excited to share the stage with my co-hosts, Claudia Antony Zompa with As You Wish Events and theBrideScoop & Desiree Dent with Dejanae Events & WEDology Toolkit. And of course, ‘The Wedding Planners’ is co-sponsored by Liven It Up Events and STAND UP, Business Professionals for Marriage Equality! The show is being produced by Rush Darwish with Rush Productions! Wednesday, October 24th for full episodes of THE WEDDING PLANNERS!